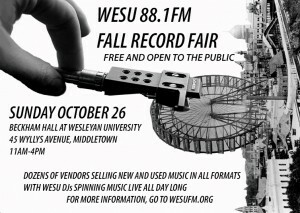 Don’t miss the WESU Fall Record Fair (and sale) on Sunday October, 26 from 11am-4pm. The event features dozens of vendors, from throughout the North-East, selling music in all formats. Plus, there’s other cool merchandise and WESU DJs spinning vinyl all day long. So, come on down and do some crate digging! You might find that album you’ve been searching for! The WESU Fall Record Fair is free and open to the public and happens in Beckham Hall in the Fayerweather building at 55 Wyllys Ave on the Wesleyan Campus (06459).